Sure, they call it Job Simulator, but they could’ve called it Not Being Very Good At Your Job Simulator. What it is: Job Simulator is a fumblecore simulation comedy game where you take on a handful of different jobs as imagined by robots in the future. That kind of sums it up, really! 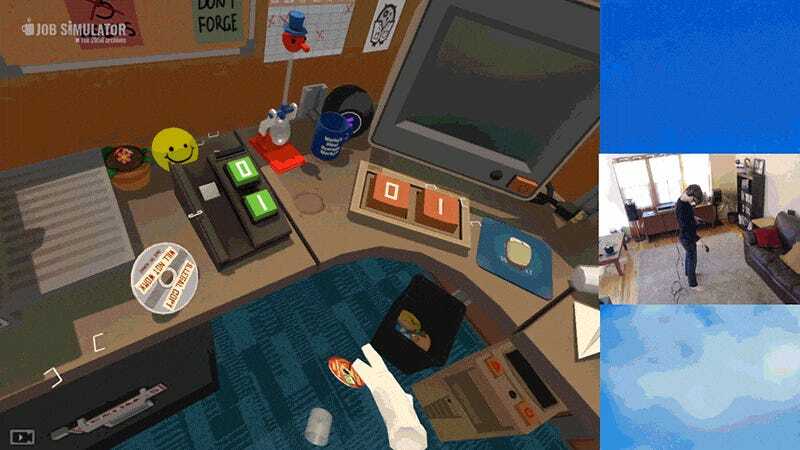 It works really well with the HTC Vive’s room-scale virtual reality, since you never move outside of your designated workspace and the interactions with your “hands” all work about how you’d expect them to. There are some weird bugs with interaction and the whole thing doesn’t amount to much more than a series of humorous vignettes, but it’s a good showcase for room-scale VR and often pretty funny. Plus, it looks as though Valve has at least temporarily bundled it in with the Vive for free, which is nice.